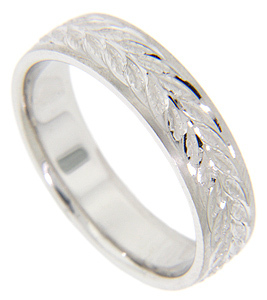 Crafted of 14K white gold, this antique style men’s wedding band features a leafy wreath design at its center. Matte finish edges frame the central pattern. The wedding band measures 6.1mm in width. Size: 12. Cannot be re-sized, but can be reordered in a variety of sizes. Also available in 18K, yellow gold, platinum and palladium. Contact us for current market cost.